This photo of Jackson Melian was taken last summer in a game played against the Birmingham Barons at Hoover Stadium. On Friday the Milwaukee Brewers claimed 22-year old Jackson Melian off waivers. If Melian plays again at BellSouth Park it may be as a member of the Huntsville Stars -- the Brewers AA farm team. 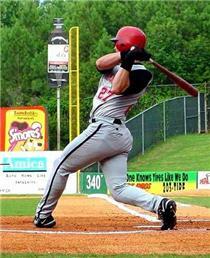 He played 120 games in right field for the 2001 Chattanooga Lookouts batting .231, with 16 home runs and 52 RBIs. He was on the disabled list twice last summer . Melian came to the Reds in a trade (made with the New York Yankees on July 12, 2000) along with right-handed pitcher Brian Reith and third-baseman Drew Henson in exchange for left-handed pitcher Denny Neagle and outfielder Mike Frank. The native Venezuelan holds swimming records in his homeland in the 50-meter freestyle.